There are many things to take into consideration before buying a travel trailer. Sleeping capacity, floor plan, manufacturer—the list goes on. Most of these things are personal choices, and can vary from person to person. One thing the majority of potential buyers will agree on is storage. You want storage space – as much of it as possible. Depending on the size of trailer you are looking at, space can be limited. If storage is minimal too, you could end up with a cluttered or overpacked trailer. To help you with your decision, I have listed eight great travel trailers with awesome storage. There are trailers out there with storage space to meet everyone’s needs. If you have a large family but aren’t keen on an enormous trailer, the Salem Cruise Lite 261BHXL is a good choice. This model is a big trailer in a relatively compact body. It weighs in at just less than 4,400 pounds when unloaded, and is about 29 feet long. Two separate sleeping areas at the front and back of the trailer are great for privacy. The back of the trailer is equipped with a double bunk bed your kids will love. This trailer has a remarkable amount of storage space packed both inside and out. You get extra large overhead cabinets in your kitchen and above the dinette. This gives you the chance to customize them later with added shelves, storage boxes, etc. Pass-through storage at the front of the trailer will allow you to keep extra or bulky items out of the way. 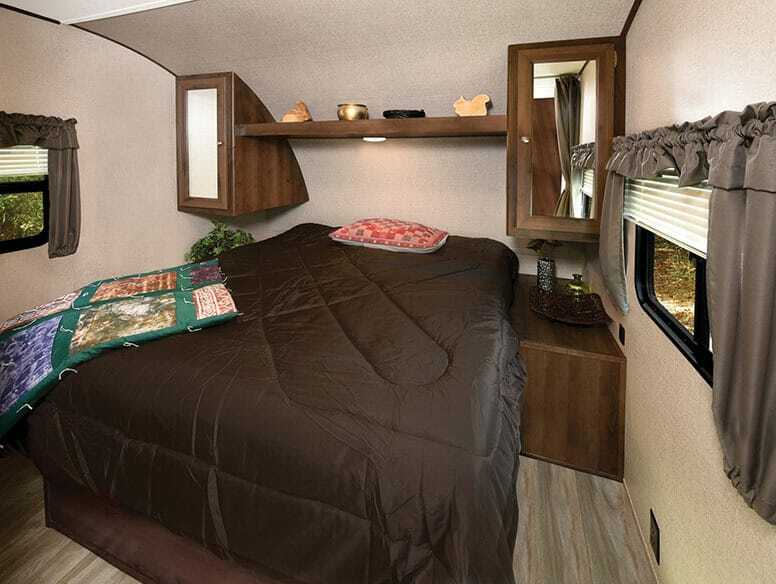 The bedroom at the front of the trailer comes with two wardrobes and a shelf over the queen-sized bed. There is even a shoe nook underneath the bed. You have eight other floor plans in this line to choose from (Midwest availability only). Double bunk bed is ideal for kids. Wide, large overhead kitchen cabinets. The Airstream Flying Cloud 19CB comes prepared for all seasons—ideal for the year-long traveler. It can sleep up to four adults. The basic model (without upgrades or extras) comes with multiple useful features. A specialized AC climate control system will keep you comfortable, regardless of the weather. Standard features include thermal windows, a heated underbelly, and a white aluminum roof. Storage compartments are everywhere throughout this trailer. The kitchen and living area have lots of drawers, pantry, and cabinet space. In the bedroom, you can store your belongings in the closet with a hanging bar. Under-the-bed storage will give you more room for whatever you have left to store. There are 18 other floor plans in the Flying Cloud series to choose from. Weather resistant and climate controlled. Three types of design available. Metallic-looking exterior is not to everyone’s taste. If you’re looking for a spacious trailer with room to live in, the Jayco White Hawk 23RMB is for you. This model can sleep between three and four people. Instead of traditional beds, there is a choice of a Murphy bed for the dinette area. The upside of this arrangement is a living area everyone can move around in. The front of the trailer has two combination wardrobe nightstands on either side of the Murphy bed. The wardrobes are full height—no more wrinkled hanging clothes. The shelves are adjustable, so you can customize the space as you see fit. In the kitchen, you’ll have two pantry closets along with an eight cubic foot fridge. With all that storage for food, there should be no need for frequent grocery trips. It’s equipped with overhead cabinets for all the rest of your kitchen items. External storage includes pass-through storage compartments at the front of the trailer. The White Hawk line includes 14 other floor plans. Sleeping areas are close together—not much privacy. The Dutchmen Aspen Trail 365BHDS can sleep up to six comfortably. If you have a big family or your kids like to bring friends along, this trailer is a good choice. This model includes two sets of bunk beds at the front of the trailer and a queen-sized bed at the back. Both sleeping areas are equipped with their own internal storage. The bunk beds sets are separated by a closet. At the rear, you will find a wardrobe that runs the entire width of the trailer. This generously-sized closet doesn’t have to be used for just clothing. You can get creative and take advantage of the extra room to bring more things along. There is also a TV shelf with drawers, and overhead cabinets above the bed for smaller items. Externally, you have an extra wide pass-through storage compartment. There are a total of 24 floor plans (including this one) in the Aspen Trail series. Two sets of bunk beds: great for lots of kids. Interior storage at both sides of the trailer. Might be too big for some—nearly 40 feet long. You don’t have to ignore smaller models to get decent storage in a trailer. Those of you looking for something more compact should check out the TAB Teardrop Camper 320S. This camper comes with all the basics, including a wet bathroom. A two-burner stove will meet your cooking needs, with a sink to wash up in. The 320S is capable of sleeping up to two people. The U-shaped dinette area converts into a generous sleeping area, while also conserving space during the day. 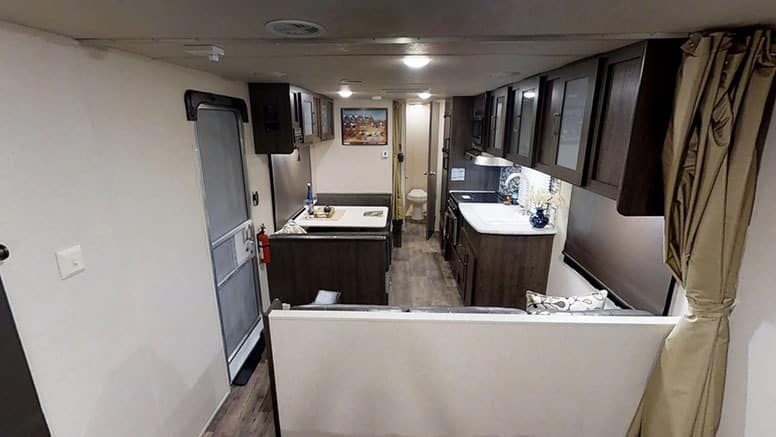 Overhead cabinets run the width of the trailer above the dinette area. As long as you pack light, you and your travel partner should be able to bring along all you need. You’ll find a wardrobe beside the bathroom for storage, and the kitchen is equipped with multiple cabinets and drawers. There are overhead cabinets above the stove, and closets below it too. Storage pockets are attached to the door, for lightweight items. There are also bare walls in the kitchen that can be used for extra storage. You can add shelves or hooks to maximize the space you have. Option to add a Boondock Package for rugged campers. If you have a low-weight tow vehicle, you don’t have to settle for a tiny trailer. At 2500 pounds dry, The Clipper Ultra-Lite 16CFB can be towed by most cars. This trailer is also an option for those of you who value fuel efficiency. And at less than 18 feet long, it falls under the 27 feet length limit of most national parks. The 16CFB can sleep up to three adults. If you’re part of a traveling couple with the occasional guest, this is the right model for you. You’ll find storage areas distributed evenly throughout this trailer. Overhead cabinets run almost around the entire trailer. Other storage areas include a closet by the door and cabinets in the kitchen. The rear bathroom may be small, but you will find a lot of wall space. When it comes to storage, empty walls are a bonus. Hang shelves, caddies, or whatever else you want. There are 22 other floor plans in the Clipper Ultra Lite line. Closet by the entrance instead of by the bed. 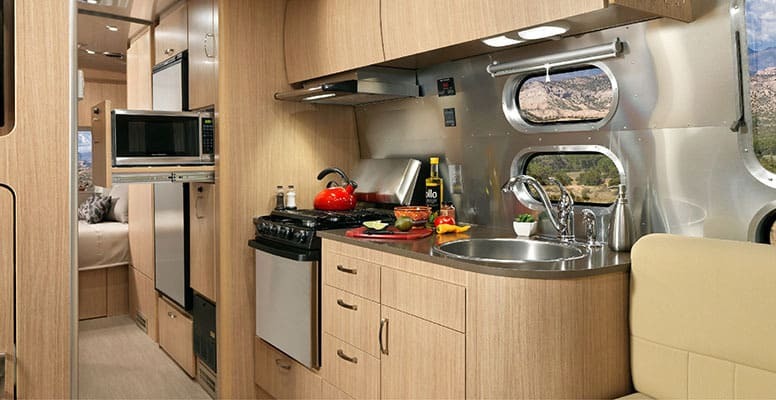 If you love camping but find yourself missing home on the road, consider the Shasta Oasis 18BH. The design of this trailer gives you many of the comforts of home. You will find ample storage room on the inside and baggage compartments outside. The sleeping areas at either end of the trailer continue with the home-design theme. The bathroom is one of those places that typically is a reminder you’re in a trailer. But in the 18BH, the large sink, bathtub and medicine cabinet will make you forget. The kitchen is full-galley style with a residential sink. Storage includes a large pantry and overhead cabinets above the dinette and cooking area. You have 10 other floor plans to select from in the Oasis line. Residential design for everything from fixtures to furnishings. The homely design style might not appeal to everyone. 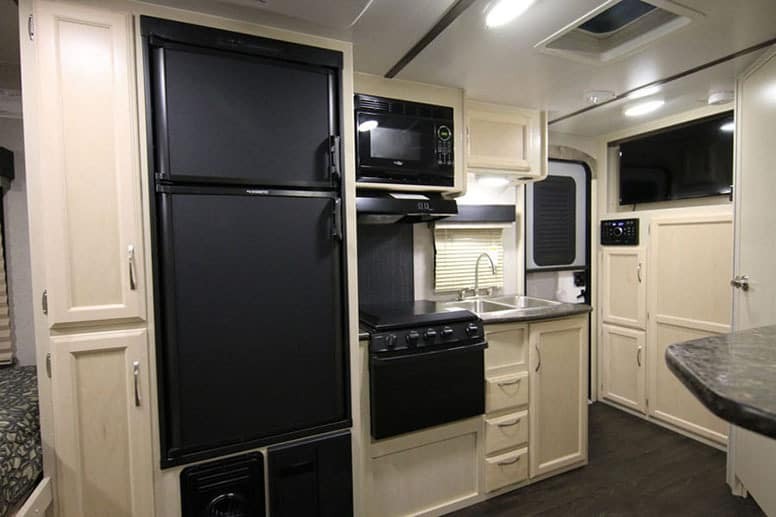 The Micro Minnie 2106DS has lots of amenities, including abundant storage compartments throughout. This relatively lightweight model includes one sofa and a Murphy bed, to sleep four people. Winnebago offers you a range of choices to customize your trailer. You have eight different colors to choose from for the exterior. On either side of the Murphy bed, there is storage space. You get a wardrobe on one side and a nightstand on the other. There is also a good amount of space between the Murphy bed and the walls for additional storage. You can add storage boxes or shelves. The kitchen includes storage cabinets above and below. One of the awesome storage features on this trailer is where you’d least expect: in the bathroom. It is rare for trailers to have more than just cabinets in the bathroom. This one includes not only a medicine cabinet (with mirror) but a full-sized closet too. There are eight alternative floor plans to choose from in the Micro Minnie series. Tankless hot water heater included (all floorplans). Slideout to increase living space. I hope you found one or more travel trailers of interest on this list. Substantial storage space is a precious thing to have in any trailer or RV. Great storage comes in travel trailers of all shapes and sizes. There’s bound to be a trailer that meets your needs and is capable of storing everything you want on the road. Do you have any other travel trailers with awesome storage to recommend? Share them with us in the comments. If this article was useful to you, please share it with friends who are in the market for a new travel trailer.